NYC, 02/26/2019, 2:00PM. Remember the Titans (2000): Struggle of a coach starring Denzel Washington. 113 min. Director: Boaz Yakin. Starring Denzel Washington, Will Patton, Wood Harris. 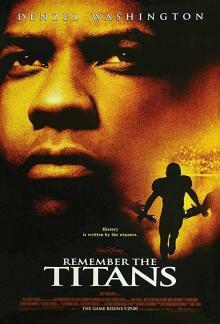 The screenplay, written by Gregory Allen Howard, is based on the true story of African-American coach Herman Boone. Remember the Titans had a budget of $30 million, it has grossed an estimated $115,654,751 in the U.S., and $136,706,683 worldwide.